Much of my job entails helping some of the smartest folks in the PR industry navigate the new communication climate. 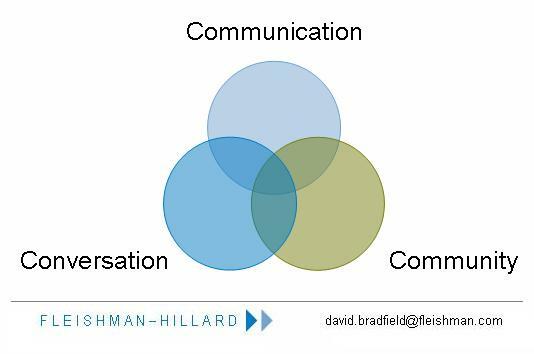 Recently, I’ve taken a step back to dissect the traditional communication toolkit and analyze how the digital realm is really impacting what the traditional communication professional does. The good news is that what we do for clients hasn’t changed. We are still charged with getting the best message to the target audience at the most appropriate time using the most effective means possible. This latter element, “the most effective means possible” is what’s changing. Communication is at the core of our business. This encompasses what we traditionally think of as PR and marketing communications. Conversation and community are nothing new. Developments in technology, and more specifically, the ability to produce and share content, and connect across geographies, open new opportunities for conversation and community. Based on this model, an organization can identify the optimal “social media mix”. This encapsulates so much of what we’re doing in modern PR. True public relations is about establishing rapport and developing a dialogue with the community. Interactive, digital and social media allow us to operate on a more integrated basis that includes mainstream media but also engages people in an authentic manner based on a common point of passion or enthusiasm. It’s human nature. Isn’t that really what it’s all about?